be shipped for planting in your area. While much of the country experienced a summer rebound last week, the Pacific Northwest got wet. High winds swept through the region and rainfall totals continued to climb, putting us more than 50 percent above our October average while only half way through the month! The autumn months are bulb planting months, but at the moment we are taking a break in the action as we wait for our fields to dry. November 1st is always the goal, so when Mother Nature allows, we will resume the race against time as we look to finish planting our nearly 1000 acres of daffodil and tulip fields. Down at RoozenGaarde we are busy planting the Display Garden. 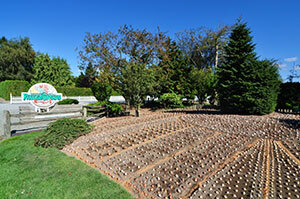 Though much smaller in size than our fields, it still takes two full months to plant upwards of ¼ million bulbs by hand. YES, we redesign and plant the entire display garden with a new layout each fall! 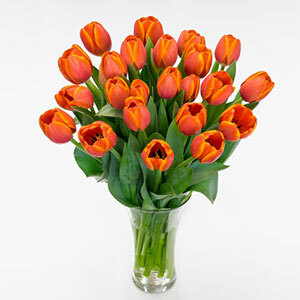 Fresh-cut Autumn Orange tulips have made their long anticipated return this fall. 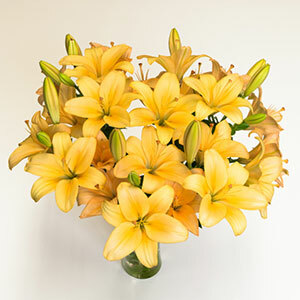 A supersized bunch, vivid color, and limited period of availability make this selection our hottest seller during the cool months of autumn. And if you like your Autumn Orange with a little bit of blue contrast, try this colorful combo! We will transition away from growing Dutch iris at the turn of the year, so get them while they last! Q: What do the terms “multiply” and “naturalize” mean when referring to bulbs? Multiply means as it sounds. Almost all daffodil bulb varieties will grow in size and then divide to produce more bulbs – yes, in this case divide equals multiply! Crocus and muscari bulbs are also excellent multipliers. 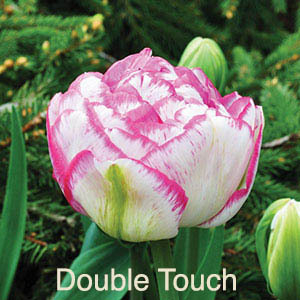 It is common for tulip bulbs to multiply although some varieties will do so to a greater degree than others. When a tulip bulb multiplies, the smaller sized daughter bulbs, or “bulblets,” will need to grow in size before they can produce a bloom. This process can take from one to three years. 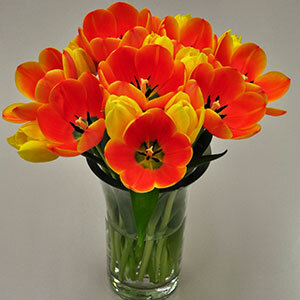 Naturalize is a term referring to a bulb’s ability to produce a flower year after year. Again, daffodils, muscari, crocuses, and irises are all excellent naturalizing varieties. Certain tulip varieties will naturalize better than others AND all varieties will have an improved chance at coming back year after year with proper care (check back with us in the spring for more care information). 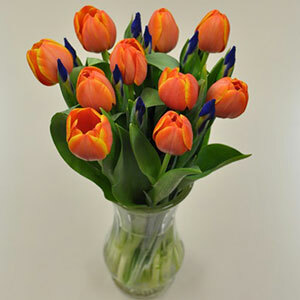 Some of the best naturalizing tulips are: the Darwin Hybrid varieties, Blushing Beauty, Double Touch, Ile de France, Purple Lord, and this Giant Orange bloom! Q: The leaves of my muscari are already a few inches tall, should I be worried? A: No. Not at all. This question fills our Ask the Expert inbox as much as any other during the late fall, but rest assured that the growth you see is normal. The muscari varieties (Armeniacum, Mount Hood, Blue Spike, White Magic, etc.) 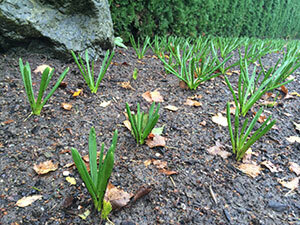 are always the first bulbs to sprout and they do so much earlier than any other bulb type. However, like every other variety, muscari will eventually enter a period of dormancy during the winter months and will then bloom after the crocuses, most daffodils, and even some tulips during the spring. All our flowers are grown and shipped right here on our Skagit Valley farm. Picked fresh each day and shipped for overnight delivery.